To use LyX as a 'LaTeX frontend', you need to install a 'TeX distribution', preferably before installing LyX itself. For Windows there are two main choices: MiKTeX and TeXLive. For a long time, MiKTeX was something like the semi-official choice, since there was a 'bundled' installer that installed MiKTeX along with LyX. But, in 2018, there were two major MiKTeX bugs that caused many users not to be able to compile LaTeX documents at all, which caused LyX essentially to stop working for those users (specifically, to be unable to export PDFs). As a result, the bundled installer was discontinued, and this page was created to help older users transition to TeXLive, and to help new users to install it for the first time. 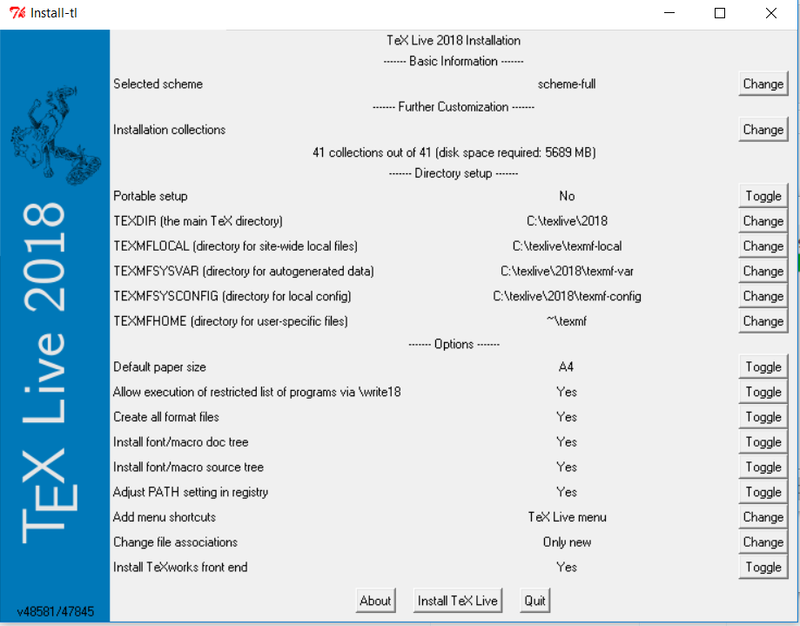 First, download the TeXLive Windows installer from this page. Second, you will need to decide whether you want to install TeXLive just for yourself or for all users (assuming you can do that). If for all users, then you will want to run the installer as an administrator. So decide what you want to do, and launch the installer. You will be given a choice between a "Simple install", a "Custom install", and "Unpack only". The "Simple install" will more or less install every 'package' available in TeXLive. (If you do not know what a LaTeX package is, please read this guide.) This is convenient, in a way, because everything is then available. But it installs about 6GB worth of data, and it takes a very long time. Plus, most of that will actually be stuff you do not need. But if you would prefer just not to have to mess around and just get on with it, then by all means go for the Simple install. If that's what you want to do, then you can ignore most of what follows. The "Custom install" is precisely what it says. It allows you to choose what to install and what not to install. We'll describe the Custom install process in what follows. The "Unpack only" option is not relevant for our purposes. So we're assuming that you are doing a "Custom install". Once the installer unpacks itself, it will launch, and you will see the following window. You should first choose a "scheme", by pressing the button marked "Change" to the right of "Selected scheme". If you keep the "full" scheme, then that is the same as doing the "simple" install. We recommend the "medium" scheme for newer users. (More experienced users may want to try the small or basic scheme, though that will require more manual installation of packages later.) We'll assume you're going with the medium scheme. Next, click on the "Change" button to the right of "installation collections". For most LyX users, it will be safe to de-select "ConTeXt and packages". You may also wish to change what language-support is installed. For example, you may not need to Polish but may need Korean. You may also want to enable "LaTeX additional packages". This will make it less likely that you will need to install extra packages later, but, on the other hand, it will take a long time to install 900MB worth of stuff, most of which you will never need (again). We recommend that you not change the default directories unless you know what you are doing. You should set your preferred paper size. We recommend that you set "Adjust PATH setting in registry" to "Yes". You may want to examine the "Add Menu Shortcuts" options and choose what you want. You can do with File Associations as you wish. Once you are happy with these settings, click "Install TeXLive". The installation is likely to take a good long time. Even still, unless you did the 'simple' installation (and even if you did), you may occasionally find that some document you are trying to create or compile requires a file you don't yet have. For help on what to do in that case, please see this page.